Located in Maltignano, in the province of Ascoli Piceno (Italy), with a structure of 1000 square meters. we design, build and install safetycage for racing cars. Standard production for the most popular cars, custom-made design for unique models built both in conformity and homologated in compliance with F.I.A. in force. 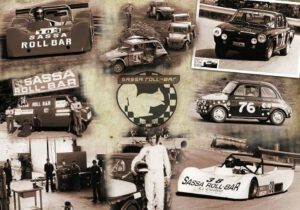 With a catalog of almost 500 models, including a vast coverage of historical examples, the SASSA ROLL-BAR boasts a long experience that allows it to be the main reference in the field of safety devices for racing cars, including safety of petrol tanks. Reinforcement of the body and assembly of the roll-bar are carried out with professionalism and competence, being able to count on a specialized staff and years of experience in the sector, specializing the company in the preparation of the bodywork on templates with TIG / MIG welding. A technical team is also put at the customer’s service, for CAD drawings and structural calculations on the body for a correct analysis regarding stiffness, balancing, weight and structural reinforcements. Thanks to dedicated processing steps and the agility of the production structure, SASSA ROLL-BAR is able to meet extremely fast delivery times with shipping throughout Europe.